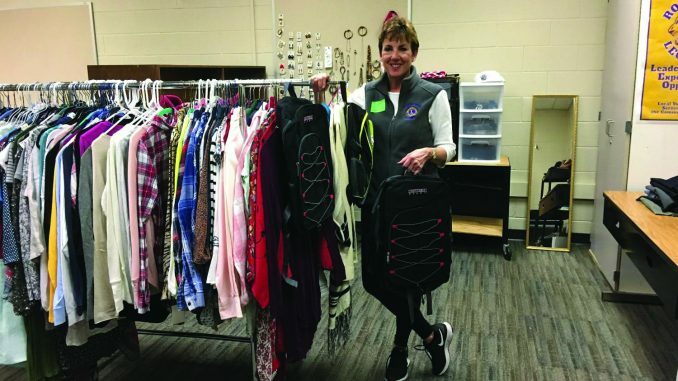 One of the most popular Community Services the Rockford Leos have started this year under the supervision of Lion Adviser Joan Heinz is the free Clothes closet at the Freshman Center. It is the first of its kind in the area, and has been so successful, East Rockford and the High School have also requested to get a Clothes Closet. Plans are currently in the works to expand the program. What is a Clothes Closet you may ask? Well, it is a fully stocked mini shopping experience. The “shop” is full of gloves, hats, shoes, backpacks, outer clothes and even under clothes—all free to those students in need! The effort is sponsored by the Leos. The Leos are Rockford Lion’s Youth group ages 12-18 in the Rockford Schools and is one of the most active service groups in the area. Most of the closet’s items are brand new or nearly new. If the student has a need, they are allowed to go on a no charge shopping experience with the help of one of the school’s personnel. The Leos will be having a clothing drive to restock the closets after the holidays. Remember, kids have needs that last throughout the year and not only over the holiday time! The Lions would like to thank the Rockford Public Schools for making the space available for this service. The Lions would also like to thank the whole community for supporting the Rockford Lions Club via donations throughout the year. Please visit www.rockfordlions.com for more information on the Lions Club, its activities or to make a donation. The Leos meet in both middle schools, Freshman Center and High School regularly. They do most of their own event planning, fundraising and organizing for all of their local service projects throughout the year. If you know a student that would like to help out our community, get some extra service hours, has an interest in leadership camp here or abroad, have them check out the Leos or contact dajoheinz57@charter.net for meeting times and further information.